Wear shoes that don’t cramp your toes. Consider soft, leather shoes or open-toed sandals. Soft insoles cushion your feet. An improper gait, such as walking on the sides of your feet, can produce calluses and corns. If you tend to wear down one side of the heel of your shoes, you may be shifting your weight unevenly as you walk. Ask your primary care doctor or podiatrist if a shoe insert (orthotic) could help distribute your weight more evenly. Pharmacies and medical supply stores have a variety of products such as tufts of lamb’s wool, moleskin pads and toe coverings to protect your skin. Gently rub thickened skin with a towel or pumice stone after bathing. Don’t try to remove all of the toughened skin at once — this process may take a week or longer. Don’t trim a corn or callus, especially if you have diabetes or circulation problems — you might introduce an infection. If you have diabetes or circulation problems, avoid over-the-counter foot care products that have salicylic acid. 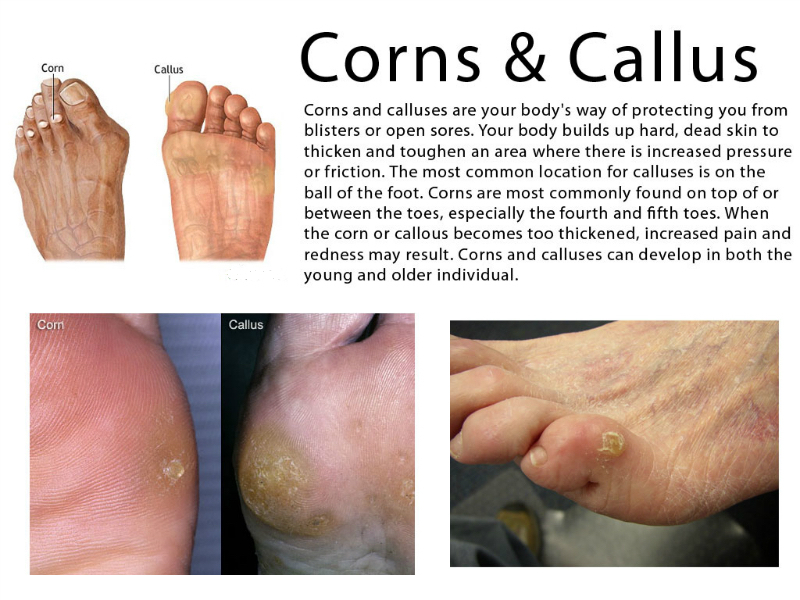 If a corn or callus becomes ulcerated or sore, see your doctor. Don’t delay, especially if you have diabetes or circulation problems — a simple problem can quickly turn into a serious one.